Richard Cordray, Democratic candidate for Ohio governor, was welcomed to Washington C.H. by a capacity crowd Sunday evening inside the confines of Our Place Restaurant. The former first-ever director of the Consumer Financial Protection Bureau, a position he was appointed to by President Obama, was greeted with enthusiastic cheers and applause from the nearly 130 in attendance as he was introduced at the annual Fayette County Democrats’ Obama Legacy Dinner. Cordray said a major positive in returning to politics is being able to visit small communities like Washington C.H. and Fayette County. Cordray was elected Ohio Attorney General in November 2008 to fill the remainder of the unexpired term ending January 2011. As attorney general, Cordray said his job was to bring back money from Wall Street to the people. 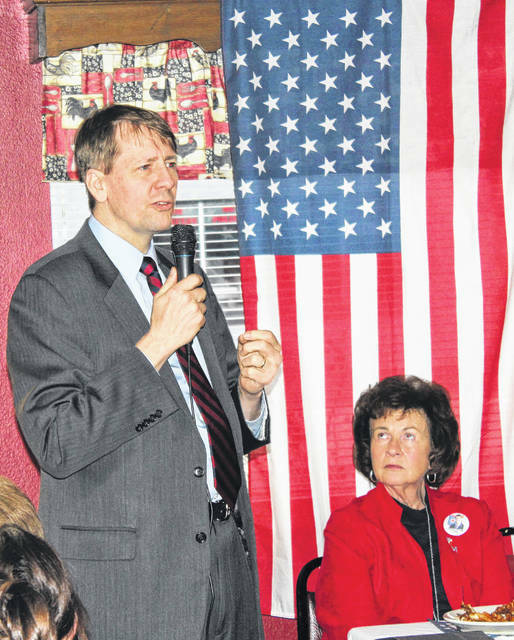 In 2010, Cordray lost his reelection bid to current Ohio Attorney General Mike DeWine, a Republican who’s also running in the race for Ohio governor. However, a new opportunity soon came Cordray’s way. Cordray said he was initially hesitant to take the job because he wasn’t interested in moving to Washington D.C. and neither was his family. He and his wife, Peggy, have two children and live in Grove City. Cordray detailed how the bureau set up a complaint line in order for individuals to report consumer complaints. This story also was greeted by loud applause from the local Democrats. Once Donald Trump was elected president in 2016, Cordray said many Republicans started calling for his job. “The complaint was always that I was too aggressive on behalf of consumers. Well, who are the consumers? It’s you and it’s you and it’s everybody in this room and everybody in our country, really. They just need to have somebody standing on their side and see that they’re being treated fairly…and that’s what we did,” Cordray said. “And I don’t mind being criticized for being aggressive for consumers because I felt we needed to re-balance the playing field in the financial marketplace and I was proud to get a chance to do that. After Cordray and his team finished up more work related to payday lending, he decided his effectiveness, amid rumors that President Trump planned to fire him, was coming to an end. He left the agency in November of 2017 and officially announced his candidacy for Ohio governor on Dec. 5, 2017. Cordray said he’s fortunate to be joined on his ticket by lieutenant governor candidate, Betty Sutton, a former three-term congresswoman. Cordray said he and Sutton are running on issues important to Ohioans, such as access to affordable healthcare, improved education for adults and children, the spread of economic opportunity throughout the state, and the opportunity for individuals to set aside enough money for a secure and stable retirement. The remaining Democratic candidates for governor are Cordray, former U.S. Rep. Dennis Kucinich, state Sen. Joe Schiavoni, former Ohio Supreme Court Justice Bill O’Neill, Cleveland doctor Jon Heavey, Larry Ealy of Dayton, and Paul E. Ray of Alliance. The primary is May 8.